Pellegrino University Professor Emeritus and renowned biologist E.O. WILSON speaks at the ARCO FORUM last night about saving the environment. See related story, page 3. 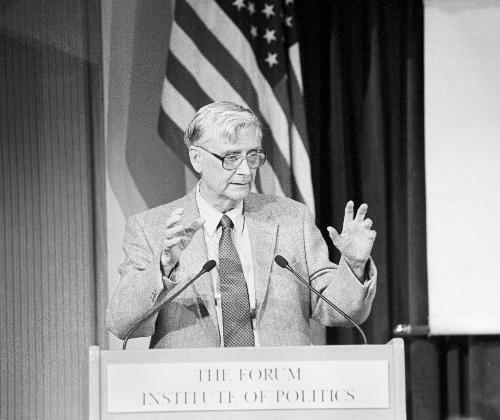 Politicians and “environmentally-innocent economists” have placed the world’s population in jeopardy by ignoring the environment, renowned biologist Edward O. Wilson told a crowd of more than 300 at the Kennedy School of Government’s ARCO Forum last night. Wilson said the world has seen “a mass extinction of species and habitat” in the past hundred years—destruction that causes human suffering and can never be undone. “By needlessly diminishing the lives of other species, we only reduce the quality of our own lives,” he said. Wilson said Americans are particularly at fault for the destruction of biodiversity. He said each human being leaves an “ecological footprint” on the environment, which is the measure of the land destroyed by human consumption. Each American destroys 10 acres of land per year, he said, while each non-American destroys 2.5 acres. “For everyone in the world to live like Americans do would require the existance of four more planet earths,” he said. Wilson used the acronym HIPPO—Habitat Destruction, Innocent Species’ Death, Pollution, Population and Overharvesting—to describe the way humans harm the environment. He described particular “hotspots” around the world, such as the Atlantic Forest in Brazil, that face acute danger from HIPPO. After outlining the problems, Wilson proposed a solution. He suggested conservation groups outbid companies at fault for destroying biodiversity, since he said these companies operate at very slim profit margins. Wilson was joined by Laura Johnson, president of the Mass. Audubon Society, and Ian Bowles, a senior research fellow at the Belfer Center for Science and International Affairs at the Kennedy School. Both environmentalists said they agreed with Wilson’s views. Johnson advocated for a “conservation ethic,” urging parents to teach their children the value of the world they live in. Bowles said the conservation of biodiversity makes sense from an economic standpoint. In a moment of levity, Zachary D. Liscow ’05, a member of the Environmental Action Committee, challenged Wilson to bring his views to University President Lawrence H. Summers. “Will you, right here and now, challenge President Summers to meet or beat Kyoto’s greenhouse reduction goals?” Liscow asked.